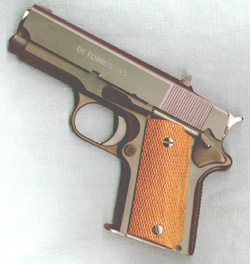 The Detonics Combat Master was a small 1911 pistol that was the first commercially viable compact 1911. It was considered a really advanced design and was highly desired. Some parts, but not all, are interchangeable with mil-spec 1911 handguns. The Detonics company went out of business, but has ben resurrected in recent years. Whether or not Detonics re-introduces the Combat Master remains to be seen.